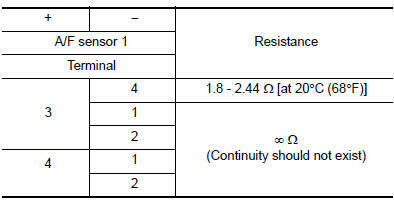 To judge the malfunction of A/F sensor 1, this diagnosis measures response time of the A/F signal computed by ECM from the A/F sensor 1 signal. The time is compensated by engine operating (speed and load), fuel feedback control constant, and the A/F sensor 1 temperature index. Judgment is based on whether the compensated time (the A/F signal cycling time index) is inordinately long or not. P014C A/F SENSOR1 (B1) (O2 sensor slow response - rich to lean bank 1 sensor 1) The response time of a A/F sensor 1 signal delays more than the specified time computed by ECM. Increase the engine speed up to about 3,600 rpm and keep it for 10 seconds. Fully release accelerator pedal and then let engine idle for about 1 minute. On CONSULT screen, select вЂњENGINEвЂќ >> вЂњDATA MONITORвЂќ >> вЂњA/F SEN1 DIAG3 (B1)вЂќ. Check that the data monitor indicates вЂњPRSNTвЂќ. If вЂњPRSNTвЂќ changed to вЂњABSNTвЂќ, refer to EC-211, "Component Function Check". Perform DTC confirmation procedure-1 again. Is вЂњPRSNTвЂќ displayed on CONSULT screen? YES >> GO TO 4. NO >> Proceed to EC-211, "Component Function Check". Wait for about 20 seconds at idle. On CONSULT screen, select вЂњENGINEвЂќ >> вЂњDATA MONITORвЂќ >> вЂњA/F SEN1 DIAG2 (B1)вЂќ. Check that the data monitor indicates вЂњCMPLTвЂќ. If вЂњCMPLTвЂќ changed to вЂњINCMPвЂќ, refer to EC-211, "Component Function Check". Is вЂњCMPLTвЂќ displayed on CONSULT screen? YES >> GO TO 5. NO >> Refer to EC-211, "Component Function Check". Is any DTC detected? YES >> Proceed to EC-240, "Diagnosis Procedure". Calculate the total value of вЂњShort term fuel trimвЂќ and вЂњLong term fuel trimвЂќ indications. Is the total percentage within В±15%? YES >> GO TO 8. Is 1st trip DTC detected? YES >> Proceed to EC-240, "Diagnosis Procedure". Loosen and retighten the A/F sensor 1. Refer to EM-30, "Exploded View". Listen for an exhaust gas leak before three way catalyst 1. Check the continuity between A/F sensor 1 harness connector and ground or ECM harness connector and ground. Check the air fuel ratio (A/F) sensor 1 heater. Refer to EC-242, "Component Inspection (A/F Sensor 1 Heater)". Check the mass air flow sensor. Refer to EC-242, "Component Inspection (MAF Sensor)". NO >> Replace mass air flow sensor. Refer to EM-25, "Exploded View". Check the PCV valve. Refer to EC-484, "Inspection". NO >> Repair or replace PCV valve. Refer to EC-15, "ENGINE CONTROL SYSTEM : Component Parts Location".